The Town took the lead on the hour mark via James Snee before a header from United’s Daniel Green evened matters up just four minutes later. Cranfield have two games in hand. Now in third spot are Wootton Blue Cross who ran out 2-1 home winners over Queens Park Crescents. Alex Smith and Xenon Paul were on the home scoresheet against a lone reply via Mohammed Raheem Jabbar for the Crescents. 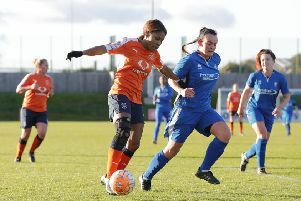 The Blue Cross took over third spot from Crawley Green Reserves who were beaten for the first time in eight outings, 3-1 at home by AFC Kempston Town & Bedford College. Tim Clarke with a brace plus a strike from Mike Stephenson did the damage against a lone home reply from Reece Green. Ickwell & Old Warden extended their unbeaten home sequence to five games in sharing the spoils from a 0-0 draw against Flitwick Town. Caldecote returned to winning ways for the first time in 10 games with a 2-1 home victory over Riseley Sports. Liam Beech netted both goals against a Sports reply via Josh Poole. Wilstead and AFC Oakley M&DH shared the points in drawing 3-3. Ranvir Thiarra, Shaun Winconek and Luke Pursey wereon the home scoresheet against M&DH replies from Jack Goodacre twice and Elijah Hukin once. Bedford Albion’s lead at the head of the Division One supported by O’Neills standings is up to eight points after they retained their unbeaten away record with a 2-0 victory at The 61 FC Luton Reserves thanks to goals from Paul Babbington and Carl Townsend. Second place Cranfield United Reserves maintained their unbeaten away record too when drawing 2-2 at Cople & Bedford SA who are now unbeaten in their last seven home starts. Ollie Hughes and Lewis Fox scored for the SA with United replies coming via Jordan Conway and Paul Ayles. Shefford Town & Campton Reserves won 2-1 at AFC Kempston Town & Bedford College Reserves. Sam Larsen and Ashley Ingham were on their scoresheet against a home reply via Bryn Reynolds. Flitwick Town Reserves returned to winning ways with a 4-2 home victory over Wilstead Reserves who have now lost their last seven away outings. Dom Collins with a brace joined on the Town scoresheet by strikes from Garath Fossey and Aibie Jaggs against Wilstead replies via Josh Whetlor and Robert Booth. Totternhoe Reserves, thanks to a lone goal from Josh Wilson, were 1-0 home winners over Sandy who have now lost their last nine outings. Henlow reached this season’s Beds FA Intermediate Cup final with a 2-1 home victory over Wixams. Shaun Faulkner and Charlie Willison netted the goals against a lone reply from Gaz White. They will now face Dunstable Town Under 21s who emerged penalty shoot-out winners at FC Biggleswade Reserves after 90 minutes had seen the sides deadlocked at 1-1, Oscar Smith netting the home goal. Houghton Athletic remain two points clear in Division Two supported by Hy-Pro after retaining their unbeaten home ways with a 2-1 victory over Black Swan (Luton) thanks to goals from Marcus Goble and Cosmin Miron against a Swan reply via Sam Fletcher. Yet right on their tail are Elstow Abbey who have played two games fewer, claiming their seventh win on the bounce with a 10-0 away thumping of M&DH Clapham Sports. Daniel Jeffries, Jason Allison and Tom Watts all netted twice to go alongside single goals from Kaylen Wilson, Carl Welham, Matt Poulton and Aiden Powell. Now in third are Atletico Europa who took their unbeaten away run to seven games in winning 2-1 at Clifton. Abuki Sulyman netted both goals against a lone home reply from Charlie Watson. This victory leapfrogged them above Meltis Albion who were beaten 3-2 at Caldecote Reserves, Carl Heath twice and Jake Wallace once netting for the home side against Albion replies via Asa Garlick from the penalty spot and Kalim Khedjari. 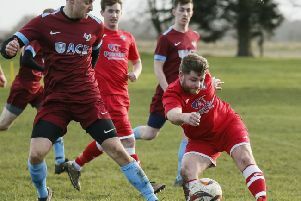 For fifth place Kempston Athletic it was the gift of three points after MK Unite Reserves failed to raise a side to meet them at Cutler Hammer. Sixth place Sporting Lewsey Park took their winning home ways up to six games in defeating St Joseph (Saturday) 5-3. Chris Gibson led the way with a hat-trick and was joined on their scoresheet by single goals from Scott Murchie and Dean Whittaker to bring up the nap hand against St Joe’s replies via Kenan Dogruer twice and Kieran Carty once. AFC Oakley M&DH Reserves were the 6-2 home winners over Marston Shelton Rovers Reserves, Jamie Donagh, Justin Muircroft and James Grandidge all netting braces against Rovers replies via Cain Boyle-Hamilton and Peter Kerr. The Pines (Luton) are 16 points clear at the head of the Division Three supported by Hy-Pro standings and still 100% for the season after winning 2-1 at Thurleigh who were being beaten for the first time in eight outings. Natham Miller and Garry Duncan netted the league leaders goals against a home reply from Alex Horn. Second place FC Polonia could only draw 2-2 at home against Shefford Town & Campton A. Przemek Gorczyca and Grzegorz Rudnicki were on the home scoresheet against Town replies via Colin Standley and Bradley Vought. Just a point behind in third are Real Haynes who won 4-3 at Wixams Wanderers. Bill Flack with a brace plus single goals from Josh Brown and Jack Ecott marked their scoresheet against a home hat-trick in reply from Joe Holmes, one of which came from the penalty spot. Whilst fourth place Bedford Albion Reserves are just another single point away following their 9-1 home win over Dinamo Flitwick. Stefan Bucur leading the way with four goals, Rushane Hendricks grabbing a hat-trick to go alongside single goals from Craig Hanna and Gary Townsend. The lone Dinamo reply coming from Daniel Day. Now in fifth are Lidlington United Sports who won 5-0 at Real Haynes Reserves. Jamie Rodd with a hat-trick plus single goals from Carl Pearson and Dale Crocker brought up the nap hand. Whilst also enjoying life on the road were Harlington Juniors the 3-2 winners at Flitwick Town A who have now lost their last five home games. Alex Frantellizzi, Joe Kitchen and Andrew Fildes the victors goalscorers against Town replies via Josh Arthur Kent and Dan Parker. Stevington Reserves will now travel to Shefford Town & Campton A in round three after winning 4-3 at Square FC. Jacob Tyler, Liam Dixon, Jason Thomson and Carl Stramaglia were on the Stevington scoresheet against home replies via Connor Taylor twice and Kevin Beales once.